Check out our classic backpack from Liberty Bags. 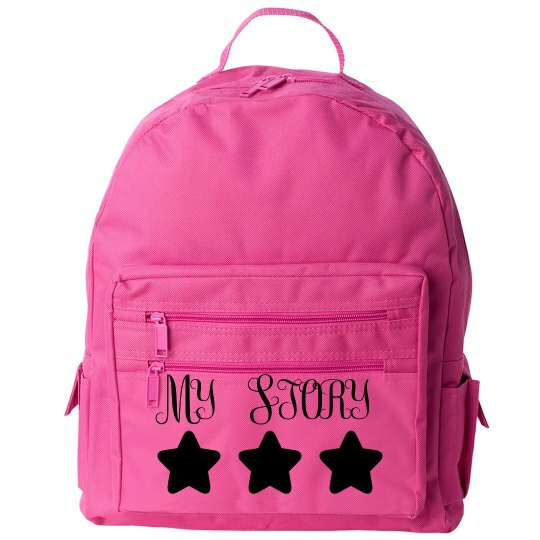 It features lots of fun pockets, zippers, and vibrant decoration potential. This back is designed for kids. Please note: it's smaller than your average backpack (like those that a high schooler would wear) but it's not super small. If you want to compare it to another backpack at home, the dimensions are: 16 inches tall, 13 inches wide, and 6 inches deep. So what's denier? Denier is a unit of weight to measure nylon or silk, mostly seen used in hosiery to describe the thickness of the material used. It also relates to the opacity of the material: the higher the number, the less opaque the item. For example, sheer nylon tights for women average around 20 denier; opaque usually 40 denier. Most nylon bags on this site are 210 denier nylon. part of the My Story collection. limited time only!